128 pages. Paper Monument. $15. Thek’s list has been passed around by serious art teachers for decades. 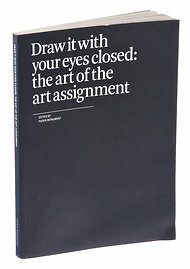 It is now reprinted in — and its spirit lingers over — a mischievous and nourishing new book called “Draw It With Your Eyes Closed: The Art of the Art Assignment,” compiled by the editors of the art magazine Paper Monument, a sibling publication of the literary magazine n + 1…. Here’s what Paper Monument’s editors, in this slim book, have had the wit to do: They’ve asked dozens of artists and teachers, some well known and some not, to speak about the best art assignments they’ve given or received or even heard of. An intense and controversial restoration of the last great work by Leonardo da Vinci goes before the public Thursday at the Louvre Museum, revealing “The Virgin and Child with Saint Anne” in the full panoply of hues and detail painted by the Renaissance master 500 years ago. The 18-month-long restoration of the painting that Leonardo labored on for 20 years until his death in 1519 will go a long way to raising “Saint Anne” to its place as one of the most influential Florentine paintings of its time and a step towards the high Renaissance of Michelangelo. The cleaning has endowed the painting portraying the Virgin Mary with her mother Saint Anne and the infant Jesus with new life and luminosity. Dull, faded hues were transformed into vivid browns and lapis lazuli that had visitors awe-struck…. Art Buzz March 13, 2012: Uncovering Leonardo da Vinci’s ‘Battle of Anghiari’ will destroy one of the great legends of Renaissance art history. Uncovering Leonardo da Vinci’s ‘Battle of Anghiari’ will destroy one of the great legends of Renaissance art history. It is one of the most influential paintings that never quite were. Commissioned for the Hall of the Five Hundred, the gigantic meeting room of Florence’s governing body in the city’s Palazzo Vecchio in 1504, Leonardo’s ‘Battle of Anghiari’ was to have been his largest painting, a vast fresco that was for centuries a watchword among artists for the portrayal of heroic muscular effort. Depicting a battle of 1440, in which the papal forces, led by Florence, defeated those of Leonardo’s home city Milan, it centred on a murderous struggle between four horsemen for the possession of a standard. Their snorting steeds writhing and rolling as the knights grapple, the scene couldn’t be further from the transcendant serenity that characterised the National Gallery’s recent Leonardo blockbuster. Yet it’s a work that changed the way artists approached the problems of movement and physical struggle. Or that is what we’ve been led to understand, for no one has set eyes on the painting for over 450 years. Its great rival in this category of non-existent exemplar was commissioned to hang on the wall opposite: Michelangelo’s ‘Battle of Cascina’. This was to have been the place where the two giants, and the great artistic rivals, of that extraordinary period came face to face across the political fulcrum of the most important city of the Renaissance. The search for a Leonardo Da Vinci masterpiece reveals intriguing traces of paint that was also used in the Mona Lisa. Art experts have drilled a hole through a 14th-century frescoed wall and recovered traces of a paint once used by Da Vinci in the Mona Lisa. The researchers believe this may be evidence that a long lost Da Vinci masterpiece has been hidden behind the wall. The work is a painting called the “Battle of Anghiari” and its recovery would be a huge discovery. Peter Paul Rubens’ copy of Leonardo’s “The Battle of Anghiari.” Click to enlarge this image. Researchers struggling to solve a longstanding Leonardo da Vinci mystery — the fate of a lost masterpiece known as the “Battle of Anghiari — have found intriguing traces of paint hidden behind a 5-inch-thick frescoed wall in Palazzo Vecchio, Florence’s 14th-century city hall. The color is consistent with that used by the Renaissance creator of the Mona Lisa, suggesting that Leonardo’s artwork has remained hidden behind that frescoed wall for more than 500 years. Known as the “Battle of Marciano,” the mural was painted by the renowned 15th-century painter, architect and writer Giorgio Vasari (1511-1574) in the imposing Hall of the Five Hundred. The hall was a room built at the end of the 15th century to accommodate the meetings of the Florentine Council. 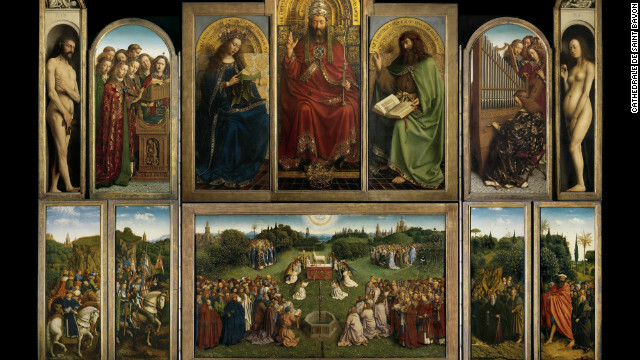 Thought to be one of the most famous panel paintings in the world, the Ghent Altarpiece, completed in 1432, can now be viewed on a specially-designed, open source website. 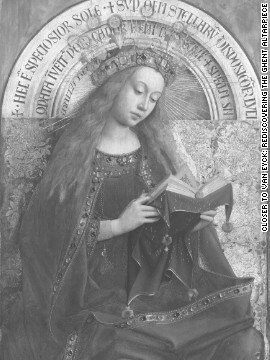 Stolen several times from St. Bavo Cathedral in Ghent where it is housed, the altarpiece features many intriguing details, including a ‘Mystic Lamb’ bleeding into a chalice. Consisting of 12 panels and depicting numerous complex theological scenes, the documentation project has rendered the work into 100 billion pixels using the highest resolution photography. 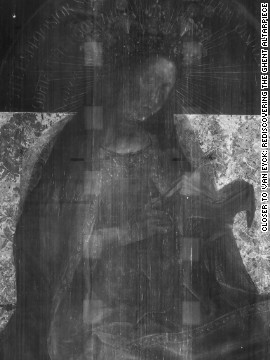 Here the Virgin Enthroned is seen in digital infrared reflectograms, which look past the painted surface of the picture and reveal the under-drawings beneath. 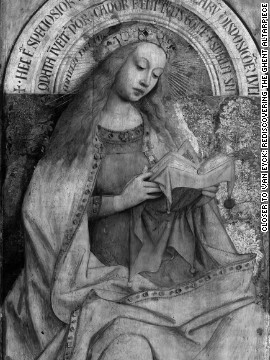 The same panel of the Virgin Enthroned seen with digital infrared macrophotographs. One major question scholars are hoping to answer is how involved Hubert van Eyck, older brother of Jan van Eyck, was in the painting of the work. Digitized X-radiographs of the Virgin Enthroned panel. These images allow the viewer to see the skeleton of the picture, revealing the evolving nature of the composition over time. 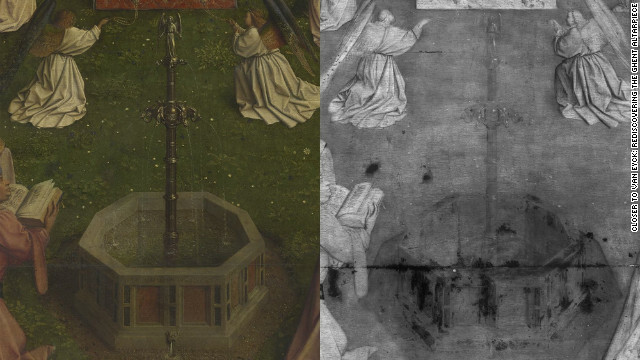 A detail from the Angel Musicians, in digital macrophotographs on the left and in digital infrared reflectograms on the right. 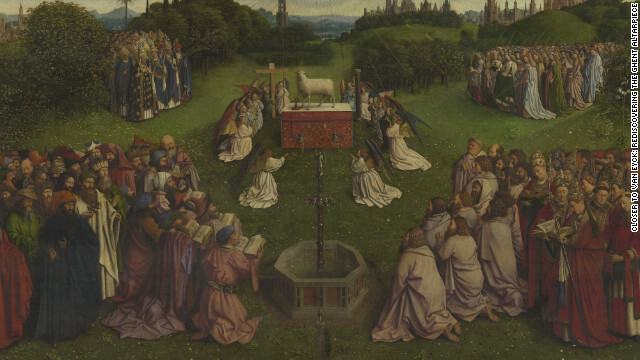 A detail from the famed Adoration of the Lamb. Viewed with digital macrophotographs on the left and an assembly of digital infrared reflectograms on the right. With its remarkably realistic depictions and dramatic history, the Ghent Altarpiece (1432) is widely thought to be one of the most famous panel paintings in the world. Stolen several times (most notoriously during World War II by the Nazis, who hid it in a salt mine), the altarpiece, currently housed in St. Bavo Cathedral in Ghent, Belgium, depicts among other things a ‘Mystic Lamb’ bleeding into a chalice. Consisting of 12 panels (one of which is a copy, the original having been stolen in 1934) and depicting numerous complex theological scenes, the documentation project has rendered the already composite work into 100 billion pixels using the highest resolution photography. 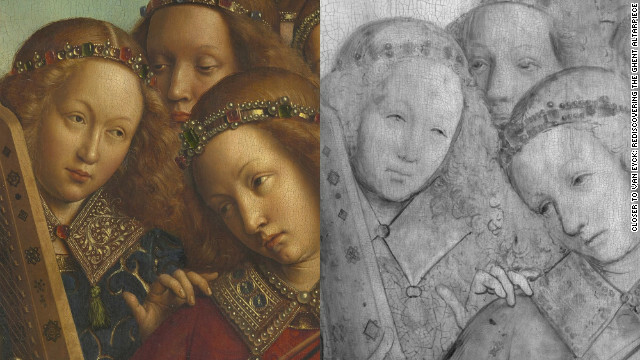 A collaboration between the Royal Institute for Cultural Heritage in Lukasweb, Belgium, and the Vrije Universiteit Brussel, and funded with support from the Getty Foundation in Los Angeles and the Netherlands Organization for Scientific Research, the venture to digitally document the work took 9 months, initially to assess it for conservation. “And then it grew into ‘These results are interesting, how can we share this information with the widest possible audience on a website?’” said Deborah Marrow, Director of the Getty Foundation. The documentation process — which made use of macrophotography in visible light, macrophotography in infrared light, infrared reflectography and X-radiography — probed beneath the painted surface to reveal the under-drawings. 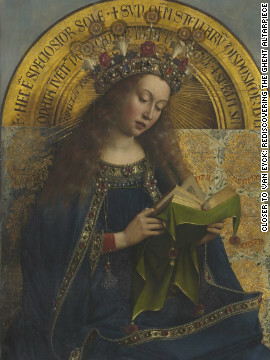 “One of the big open questions surrounding the polyptych is the involvement of Hubert van Eyck, the older brother of Jan van Eyck, in the production of the painting,” said Ron Spronk, Professor of Art History at Queen’s University in Kingston, Ontario, who led the project.